Murat Muftari is a Senior International Trade Specialist in the International Trade Administration’s U.S. and Foreign Commercial Service and founder of the Vets Go Global initiative and a former U.S. Special Forces soldier. On Veterans Day, November 11, 2018, let us take a moment to honor America’s veterans for their sacrifice and willingness to serve for the common good of a grateful nation. For many veterans, their service continues well beyond the battlefield and into the commercial and private sector where transitioning veterans continue to evolve their mission from military boots to executive suits. Whether we look at veteran-owned or veteran-led businesses, it comes as no surprise that veterans thrive as leaders. Their business leadership skills are particularly well suited for international business, where their understanding of the geopolitical environment and how economic factors play a prominent role in U.S. national security allows them to help unleash American ingenuity and expand economic influence around the world. This economic influence helps provide economic security, defined as the ability to protect or advance U.S. economic interests in the face of events, developments, or actions that may threaten or block these interests. And this economic security translates to protecting U.S. national security. That is why the International Trade Administration and the Vets Go Global initiative works to better empower veteran-owned and veteran-led businesses to continue their mission of protecting our nation, from the frontlines of war to the frontlines of international commercial activity. The economic well-being of the United States depends on the smooth conduct of national and international commerce, so the U.S. can continue to play a prominent role in shaping the international economic environment. There are a multitude of tools and resources that the International Trade Administration provides to assist American businesses, all a form of economic means to help achieve national security ends. These tools include offering U.S. Commercial Service export promotion services to help increase American exports and the relative size of the U.S. economy; direct U.S. government support of U.S. companies competing for foreign government contracts through programs like the International Trade Administration’s Advocacy Center; increasing foreign investment in the United States through programs like SelectUSA; maintaining access to foreign markets and reducing trade barriers through U.S. Commercial Service commercial diplomacy efforts; and promoting market-oriented economic policies and free and fair trade agreements that help U.S. companies to compete and win in international markets. Continuing to build an American economy that is more dynamic and more robust than economies elsewhere cannot be taken for granted. That is why we must continue to support veteran businesses and all U.S. businesses with the resources and tools they need to survive and thrive in international markets. The Vets Go Global initiative will continue to collaborate with private and public organizations that offer resources to veterans by presenting additional avenues of economic opportunity to veteran-owned and veteran-led businesses and helping them survive and thrive in global markets. I call on the veteran-owned and veteran-led business community to continue to rise to the occasion when opportunity knocks and seek to grow your business in international markets. To get started, and learn more about existing export opportunities and resources, contact the Vets Go Global team at vets@trade.gov or your nearest Export Assistance Center. Again, I would like to personally thank the brave Americans who have served – as well as their families – and those who continue to serve our country as members of the Armed Forces. The global economic headwinds currently facing U.S. businesses are enough to force even the most intrepid exporter to search for safe harbors. However by mitigating the risk inherent to international trade, you can sail into these economic headwinds with confidence. Trusting in these three tips, you should be better prepared to navigate the turbulent waters of international commerce. From the viewpoint of a U.S. exporter who chooses to sell in foreign currencies, FX risk is the exposure to potential financial losses due to devaluation of the foreign currency against the U.S. dollar. Obviously, this exposure can be avoided by insisting on selling only in U.S. dollars. However, such an approach may result in losing export opportunities to competitors who are willing to accommodate their foreign buyers by selling in their local currencies. FX Risk Management options include: Non-Hedging FX Risk Management Techniques; FX Forward Hedges; and FX Options Hedges. A forward contract enables the exporter to sell a set amount of foreign currency at a pre-agreed exchange rate with a delivery date from three days to one year into the future. For example, U.S. goods are sold to a French company for €1 million on 60-day terms and the forward rate for “60-day euro” is 0.80 euro to the dollar. The U.S. exporter can eliminate FX exposure by contracting to deliver €1 million to its bank in 60 days in exchange for payment of $1.25 million. Option Hedges are used for exceptionally large transactions that have been quoted in foreign currency. Under an FX option, the exporter acquires the right, but not the obligation, to deliver an agreed amount of foreign currency to the FX trader in exchange for dollars at a specified rate on or before the expiration date of the option. While FX options hedges provide a high degree of flexibility, they can be significantly more costly than FX forward contracts. The Export-Import Bank is one source for export credit insurance (ECI). ECI protects an exporter of products and services against the risk of non-payment by a foreign buyer. ECI generally covers commercial risks, and certain political risks that could result in non-payment. ECI also covers currency inconvertibility, expropriation, and changes in import or export regulations. The exporter should negotiate a foreign sales agreement to expressly define the roles and responsibilities of the parties. Most representatives are interested in your company’s pricing structure and product profit potential. They are also concerned with the terms of payment; product regulation; competitors and their market shares; the amount of support provided by your firm, such as sales aids, promotional material, and advertising; training for the sales and service staff; and your company’s ability to deliver on schedule. The contract may contain provisions that specify the actions of the foreign representative. For example, a non-disclosure agreement, non-compete clause, and instructions on how to handle inquiries from outside their sales territory should be included. It may be appropriate to include performance requirements, such as a minimum sales volume and an expected rate of increase. Be sure to include an escape clause in the agreement that allows you to end the relationship safely and cleanly if the representative does not fulfill expectations. Finally, the agreement with the foreign representative should define what laws apply to the agreement. Even if you choose U.S. law or that of a third country, the laws of the representative’s country may take precedence. Many suppliers define the United Nations Convention on Contracts for the International Sale of Goods (CISG, or the Vienna Convention) as the source of resolution for contract disputes, or they defer to a ruling by the International Court of Arbitration of the International Chamber of Commerce. By mitigating risk factors associated with international transactions you’ll have greater confidence to engage in international trade. Moreover, by making use of these three simple tips, instead of being blown back, you’ll sail forward into the economic headwinds facing exporters today. The U.S. Department of Commerce, including the members of its Vets Go Global team, are here to assist you take your business into new and exciting global markets. This post contains external links. Please review our external linking policy. Murat Muftari is an International Trade Specialist in the International Trade Administration’s U.S. and Foreign Commercial Service working out of the Long Island, NY U.S. Export Assistance Center. Our Vets Go Global team met with veteran-owned businesses at the National Veterans Small Business Engagement to provide export counseling. Connecting veteran-owned companies to export education opportunities, something our U.S. Export Assistance Center in Connecticut is already doing. Providing customized export counseling on the frontlines of veteran-owned business events. This is happening at the National Veteran Small Business Engagement (NVSBE) conference, where the Vets Go Global team is exhibiting and engaging with veterans through a learning session. Continuing to evolve this initiative to best support those who have served our country and maximize their export potential. 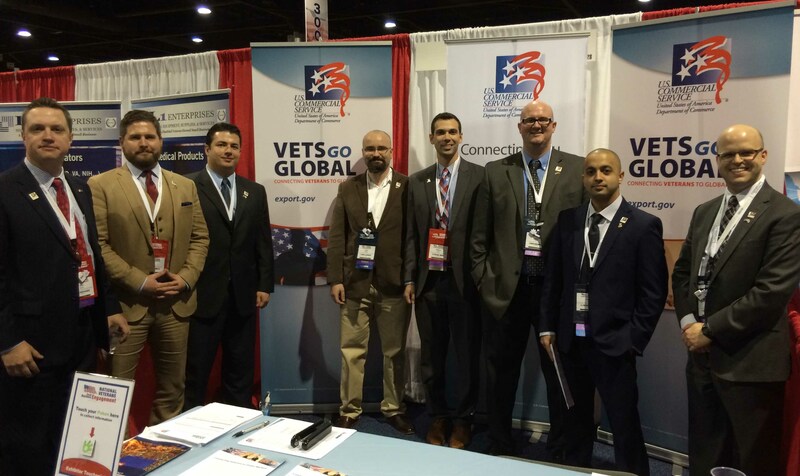 Update: Follow the Vets Go Global team on Twitter for news about upcoming initiatives! Our Vets Go Global team believes in veteran-owned businesses and the important business skills they bring to the table — like adaptability, attention-to-detail, discipline, intercultural communications, objective-based focus, leadership, and perseverance. Those are the skill-sets that increase any company’s probability of success in international business. As veterans, we look forward to bringing back that battlefield camaraderie to our work with veteran business owners. To the veteran-owned business community, we’ve got your six in the global marketplace. Let us help you expand your exports and increase your bottom line. Contact your nearest Export Assistance Center to get started.